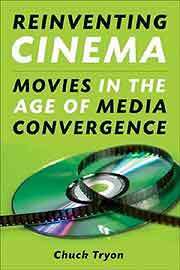 The next time you hear someone whining about the iPod killing film; or waxing rhapsodic about how the Internet is going to set all of cinema free: Well, you can whack them both in the back of the head with Chuck Tryon’s well-researched and thoroughly well-reasoned book Reinventing Cinema: Movies in the Age of Media Convergence. It’s a bit of a slender tome — about 180 pages — so the whacking won’t hurt so much, but the sentiments in the book should give everyone concerned with media in these new digital media times much food for thought. Tryon successfully counters the extreme rhetoric about digital media on both sides of the aisle by debunking the popular myths trotted out and regurgitated by the doomsayers and the utopians. The ultimate lesson learned from Reinventing Cinema is that the digital revolution isn’t really revolutionizing anything. Yes, it’s true that media has been altered in the age of the Internet, DVDs, iPods and CGI-laden special effects films, but these alternations are just like any of the other evolutionary changes that media has gone through in any age. In each chapter, Tryon tackles a different aspect of the new digital entertainment era: From DVDs turning ordinary citizens into educated cinephiles, to the rise of CGI spectacles in the ’90s to prepare us for our engagement with the Internet, to the switch from film to digital projection in theaters, to filmmakers being able to distribute their film electronically to mass audiences, to film blog culture, to digital remixing of old film classics. Although slightly academic in tone — fitting since Tryon is an academic as an assistant professor at Fayetteville State University — Reinventing Cinema is an engaging, conversational read. While reading the book, I found myself actively composing responses, additions to and arguments to each of his arguments, as if I was preparing to leave a comment on his blog, The Chutry Experiment. (You will find me commenting over there occasionally.) And as an academic, Tryon isn’t trying to sell his readership anything with the book, so it all comes off as an excellent conversation starter than trying to be an end-all, be-all pronouncement. One thing to note, though, is that Tryon’s main focus is the cultural ramifications of movies switching from a celluloid to digital production and delivery systems. He does touch a little bit on the economics of such a switch, such as theaters moving into digital projection and independent filmmakers being able to distribute their work over the Internet without the interference of middlemen. However, he purposely avoids discussing the artistry of film and making value judgements on the films he uses as examples, from big budget spectacles like The Matrix and The Ring to independent features taking advantage of cheap digital production like Four-Eyed Monsters and Uncovered: The Whole Truth About the Iraq War, which within the context of his thesis feels appropriate. Under that thesis, Tryon paints a picture of a brave new world that’s not to be feared nor hyperbolized. While the media landscape is certainly evolving, the basic paradigm isn’t being obliterated anytime soon. The mainstream entertainment business is currently way too entrenched through a network that has grown to incorporate new technologies. Even though truly independent filmmakers do now have the ability to transmit their films to a limitless global audience, the problem those filmmakers still face is a matter of discovery and getting their projects in front of that audience. As Tryon notes, while consumers have the ability of consume films in a variety of formats these days, Hollywood studios of having the advantage of being economic juggernauts that can take the hit of using theatrical releases as loss leaders to at least create awareness of their products that they can then sell in those different formats. Independent filmmakers still have an extraordinarily tough struggle to break through the Hollywood noise machine. Yes, there are thousands, if not millions, of film blogs out there with the ability to write about all kinds of films, still the biggest blogs are going to write about the biggest films: Hollywood films. Plus, while Tryon avoids discussing the artistry of film, it’s still implied that spectacle, e.g. The Matrix, is going to triumph over micro-budget romantic comedies, e.g. Four Eyed Monsters, for general audiences. Our media landscape is definitely changing in the digital age, but we need to watch out for the doomsayers and hucksters. To navigate this new world, there needs to be more reasoned analysis on par with what Tryon has accomplished with Reinventing Cinema. Buy Reinventing Cinema on Amazon.